Ah, you're right, according to a Galaxy map shown in Combat Evolved and Halo Reach, Soell is near the Rim or out side the Rim of the Galaxy. A system by the name Epsilon Indi exists in real life, but it is only 11 light years from Earth, whereas Epsilon Indi in Halo: Contact Harvest is not given an exact distance from anywhere but is described to be the furthest outer colony world, six weeks away from Madrigal, which is approximately 84 light years away from Sol, and two months from Reach, which is 10.5 light years from Sol. Therefore it is possible that the Epsilon Indi system in the Halo universe is situated differently than the real-world one. How would I go about making a Moon have vertical rings like this? Tilting its rotation axis by 90 degrees would presumably work; Uranus has rings like that too, for example. Unfortunately no, since this map is not canon. Almost all of the Halo universe was set in a relatively small part of our galaxy (less than 1kly wide). Even the smallest region on this map is bigger than the whole of UNSC territory. Yeah that maps scale is way out of whack. Actually, that map IS fairly accurate. It assumes a lot, but is technically possible to be canon. Anyways, would it be possible to have the array be floating around as planets? How would I mod that? What's with this UID thing? I made an account before here and it wasn't required. No it isn't. It places Reach thousands of light-years from Earth. In reality it is only 10.5. That map was basically made just to be pretty, without any heed to aligning the locations of Halo with real astronomical objects (which in many cases were explicitly stated). I was under the impression that map only shows an arm of the galaxy, not the entire galaxy. Having been a memeber of the universe fourm on bnet before it's fall from grace, I assumed that map was accurate, given it was widely acclaimed at the time. Regardless, we DO know the exact location of Eayn (The jackal home world), given that it is the moon of a planet in a real, known solar system. We also, apparently, know the location of reach's system. We could use those two locations as base points for estimates of the others. The author of the above map has an updated version, but it cannot be accessed ATT due to bungie.net being offline right now. I was under the impression that map only shows an arm of the galaxy, not the entire galaxy. 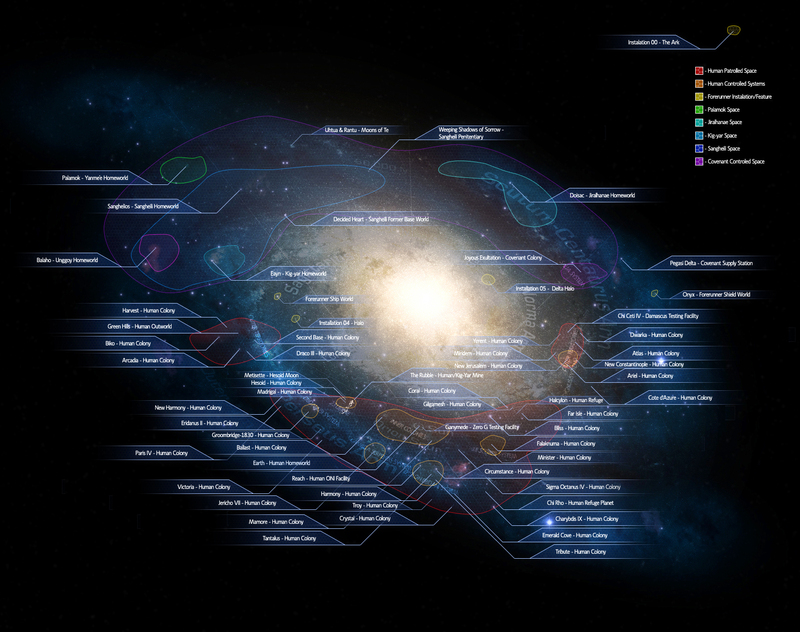 The above map clearly shows the entire galaxy, as evidenced by its appearance and by the fact that the galactic arms are labeled (look closely). Also, the Ark is sitting outside the galaxy at top right. Anyways, whatever happened to the old log in system? My original account is still active, but I can't figure out how to log into it now that everything uses Uid. I have no idea. I think uID was how it was done by the time that I joined. Only SpaceEngineer can possibly answer that. Oh wow this thread is back. My HD crashed and I lost Reach and the others, I'll remake them after 0.9.7 comes out. Reach is the easiest, it has the most info on it. Want me to help work on ships for it? 97 will make porting ships with multiple textures much easier and I'd be glad to help out.